Kili, Truman, and Santina set out on a quest to crack some really tough nuts. Kili, the lightweight, took on an almond in the background. Truman cracked a hazelnut and a brazil nut in less time than it took for Santina to crack her nut. But, Santina takes the prize for cracking the toughest of nuts, the Macadamia. The patient macaw worked at it for a good half of an hour. She kept rotating and testing the nut looking for the weak spot. 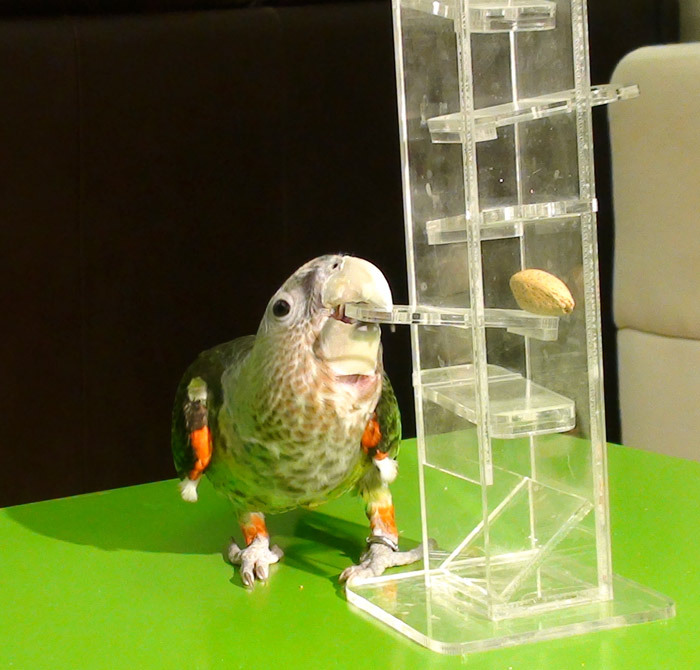 Truman uses a similar approach for hazelnuts, which for his beak size, should be nearly impossible. Santina could not just crack the Macadamia. The best she could accomplish with her powerful beak was to just chew a little hole into the top of the nut and then extract the inner goody with the tip of her beak. I even got Santina to share her bounty with the two smaller birds by trading her a hazelnut which she could easily open. Kili and Truman dug in with their beaks and extracted some of the nut from the shell. Santina of course got her hard earned nut back to finish the job. I can assure you that not one morsel was left inside. Some people ask me how I taught my parrots to open such difficult nuts. The truth is they learned to do it themselves but it was my encouragement that got them to try hard enough to get to that point. If I am trying to get a parrot to learn to open a new nut, I substitute training for a nut opening session. The same learning mindset comes into play and the same motivation that could be applied to training can be applied to learning to crack tough nuts. In the beginning I try to offer an opened nut or scour the shell with a knife so the bird can learn how good the result is. The next few times I try to find the smaller/easier nuts. And with time the bird learns patience and perseverance and can be kept busy for long periods of time with a tough nut to work on. This was not just a nut opening exercise but also a tolerance training exercise for the flock. By getting them all busy and goal focused on their own tasks, I am able to teach them to tolerate each other in closer proximity without fighting. The Cape Parrot and Macaw shared the same perch for the entire duration. It's a good way to build friendship while challenging their jaws and minds. 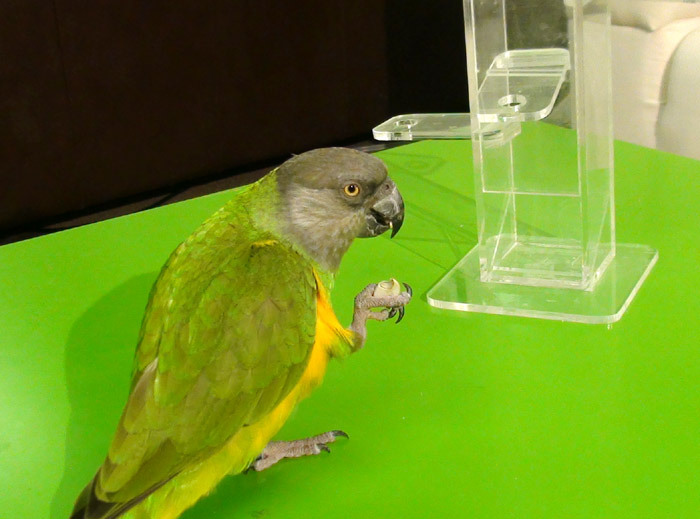 Check out this video of how the parrots crack some really tough nuts. 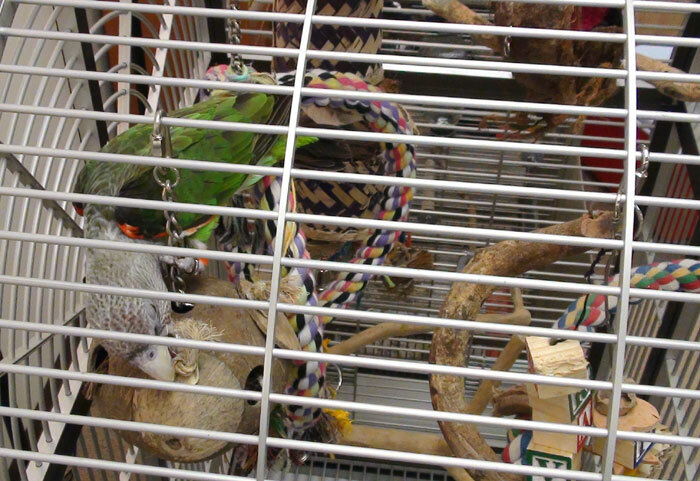 I came across a Parrot Foraging Tower at the bird store while shopping for some supplies. It was very expensive but the store owner seemed fairly eager to get rid of it by lowering the price to just expensive. Thus I brought the tower home for Kili and Truman to play with. Kili being the trained parrot that she is was ready to learn the trick but only with my guidance. She would not just play with the tabs and figure it out on her own despite the treat being in plain sight. She waited for me to show/tell her what to do but then mastered the basic task very quickly through clicker training. She already knew the pull command from the magic drawer trick so it was mainly a matter of clicker training her to apply it to the tower. But the tower is much bigger than she is, so she couldn't go beyond two tabs to pull on. Truman on the other hand became master of the parrot foraging tower. Not only is he tall enough to reach the top tab if he stands on his tippy toes, but his hooked beak is perfect for pulling the tabs open. Truman had a slight advantage in that he watched me train the trick to Kili. However, I never worked with him and the only rewards he got for attempting the trick were from the tower itself. After just a handful of almonds and sessions, Truman learned that pulling all the tabs out was key to getting the nut to fall out. Still, he does not follow any logical sequence for pulling the tabs. However, from a reinforcement standpoint, the sequence is irrelevant and the nut will only come out when all tabs are pulled out. All advantages are on the side of Truman with this one. Not only on size and strength but also perseverance. Kili is more focused on following commands and doing tricks to earn treats from me. If the toy isn't rewarding her quickly enough, she'll turn to me and say hello or show her wings for a treat rather than keep working at it. On the other hand Truman is slower and more thoughtful. He'll approach the tower from different sides and keep working for 10 minutes if he has to until the nut is his. Then he'll spend a few more minutes still, working the nut out of its shell. Quite the entertainment package for a brainy Cape Parrot. In the video you can see Truman step away and think before approaching the tower again. He takes many breaks but he doesn't give up. His persistence pays off with a large tasty nut. 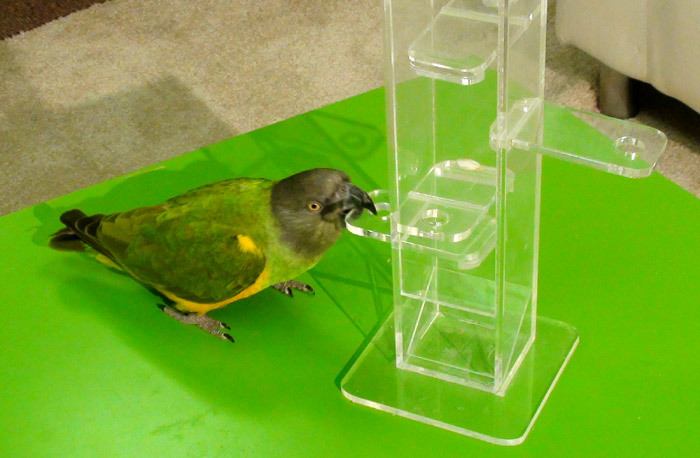 While I still believe that trick training is both the best mental exercise and relationship building for parrot and owner, good foraging toys are a must for when the owner is away. Just an hour or two of trick training and interaction per day simply isn't enough to meet a parrot's intellectual needs. I would argue that a good training session (especially involving flight and complex behaviors) can make up for hours of down time, but still not a complete substitute. This is why stimulating toys are a must. 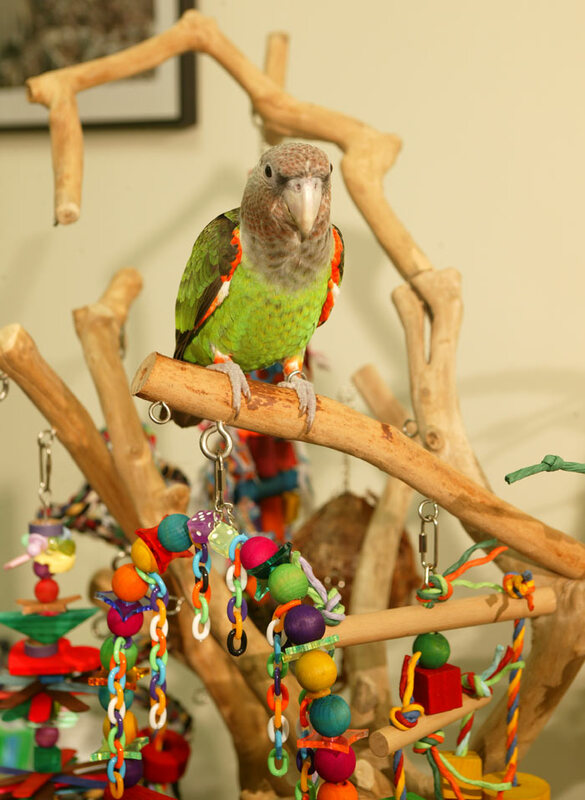 Parrot toys come in three categories: chewing, playing, and foraging. Ideally a parrot should have at least one of each category in its cage at all times. 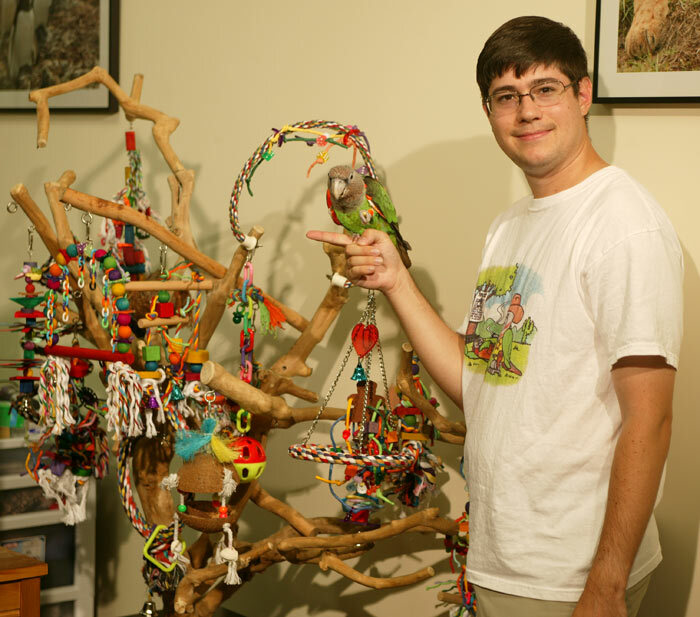 Chewing toys are usually comprised of a lot of wooden parts that are appropriate for the parrot's size and beak strength. These are the toys that you come home to see bare not long after hanging them. These are important to keep your parrot busy and beak trimmed. Better that they be chewing on that then your furniture when they are out. 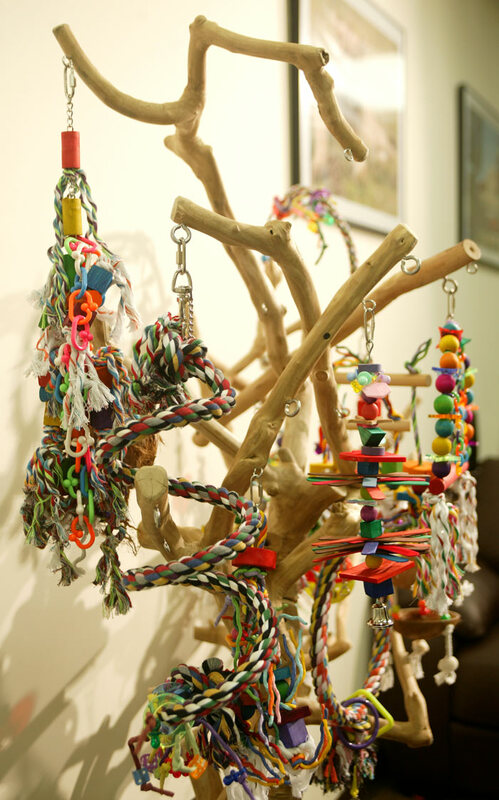 The play toys are often made of tougher materials and involve the parrot interacting with them in non-destructive ways such as pushing, pulling, swinging, ringing, etc. Finally, foraging toys are the third category of parrot toys. In a way these are the ultimate toy because they involve both play and destruction. Foraging toys can best be described as toys with goodies inside. In the simplest sense they are toys with food treats inside but I'd like to talk about going beyond just treats. Since I do a lot of formal parrot training, I don't approve of food oriented toys because then the parrot won't be hungry when I get home and want to do training. So instead, I try to focus on non food based foraging toys. For a parrot that doesn't know how to play with toys but is treat oriented, hiding food in toys is a great way to get them started. 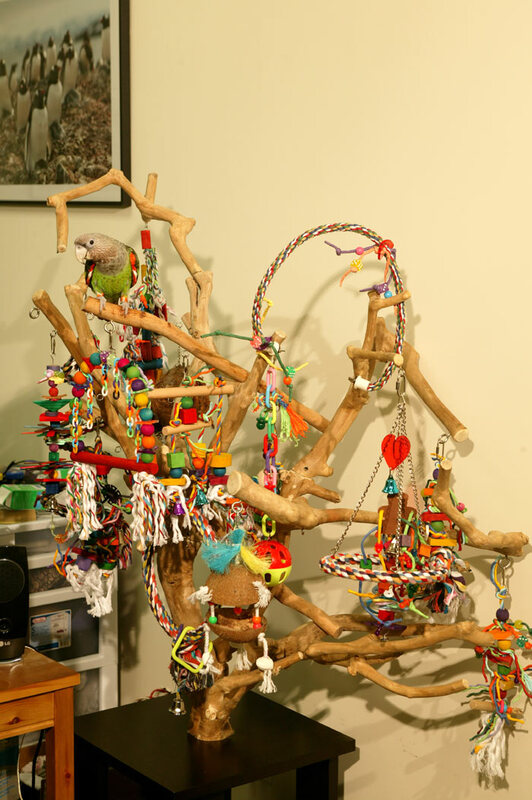 However, for a naturally inquisitive/playful bird like Truman, just having more toys inside is enough. When toy shopping for my parrots, I especially look out for sophisticated toys like this. Another thing I like to do is to hang toys near swinging perches rather than solid ones. 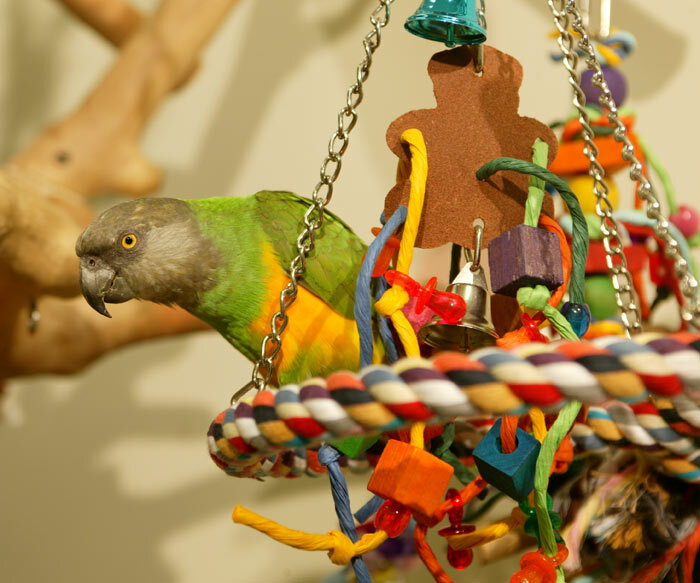 If the parrot is perched on a solid perch, it is all too easy to shred a toy to smithereens in no time. However, if the parrot is standing on an already swinging perch and the toy moves, it really provides a challenge. Not only is it mentally challenging to move the swing and toy to reach, it is also great exercise. The parrot has to use all of its muscles to balance, hold, and play. In the video below you can see how Truman is holding onto his swinging atom with one foot and the coconut foraging toy with the other. It's both an exercise and a challenge to keep him busy while I am away.